Gerald R. Patterson, Ph.D., OSLC founder and Senior Scientist Emeritus, is well known for his pioneering work in three major areas in psychology: a theory of aggression, parent-training forms of intervention, and multiple-method measurement with emphasis on direct observation of family interaction. 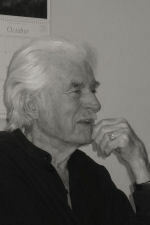 His work at OSLC expanded the theoretical and empirical foundation for coercion theory, which provided a firm basis for the later development of the Oregon Model of Parent Management Training (PMTO™). He was later involved in applying data from randomized PMTO intervention trials to demonstrate experimentally that the causal mechanisms underlying aggression are in keeping with the tenets of the coercion model. His numerous awards include the Distinguished Scientist Award from the American Psychological Association, the Outstanding Achievement Award from the University of Minnesota, an honorary doctorate from the University of Norway in Bergen, a Lifetime Achievement Award from the International Society for Research in Aggression, and a Merit award from the National Institute of Mental Health for excellence in research. In addition to more than 200 peer-reviewed journal articles, he authored or co-authored several books: Families, Living with Children, Coercive Family Process, Families with Aggressive Children, Parents and Adolescents, Antisocial Boys, and Antisocial Behavior. In addition to these profound academic contributions, Jerry will be remembered as a charismatic, visionary leader and mentor. His published works span a range from ground-breaking research to practical parenting guides to a memoir about his early life. Raised in a cabin in northern Minnesota, he had a lifelong love of the outdoors, particularly wilderness exploration by canoe. An advocate for empirical rigor, one of Jerry’s favorite expressions was “show me the data” (an alternative version was: “In God we trust; all others, bring data”). Those who worked with him noted that he had a talent for “leading from behind” and mixing work and creativity with laughter. His infectious and relentless curiosity and encouragement inspired the successful careers of many scientists.